Get outdoors at Swim with Dolphins and Ebony Forest Reserve. You'll explore the less-touristy side of things at Black River Gorges National Park and Le Morne Brabant. There's still lots to do: take in the dramatic natural features at Seven Colored Earths, explore the activities along Underwater Waterfall, admire the sheer force of Chamarel Waterfall, and look for gifts at Tou Korek Surf Shop. For maps, photos, traveler tips, and tourist information, you can read our Le Morne trip itinerary planner. Kelowna, Canada to Le Morne is an approximately 31-hour flight. The time zone difference when traveling from Kelowna to Le Morne is 12 hours. 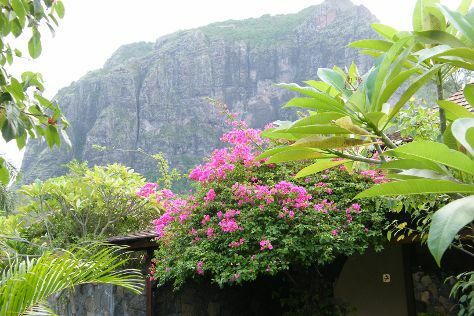 In October, daily temperatures in Le Morne can reach 32°C, while at night they dip to 24°C. Cap off your sightseeing on the 12th (Sat) early enough to travel to Plettenberg Bay. You'll discover tucked-away gems like Garden Route (Tsitsikamma, Knysna, Wilderness) National Park and Monkeyland Primate Sanctuary. Step out of the city life by going to Robberg Nature Reserve and Birds of Eden. Get out of town with these interesting Plettenberg Bay side-trips: Knysna (Goldsmiths Knysna | Bespoke Jewellers | Diamond Dealers & Knysna Heads). The adventure continues: tour the pleasant surroundings at Tenikwa Wildlife Awareness Centre and take in the architecture and atmosphere at St. Christopher Catholic Church. Plan a Plettenberg Bay trip in moments using our itinerary builder. Explore your travel options from Le Morne to Plettenberg Bay with the Route module. The time zone changes from Mauritius Time to South Africa Standard Time, which is usually a -2 hour difference. Prepare for a bit cooler weather when traveling from Le Morne in October: high temperatures in Plettenberg Bay hover around 24°C and lows are around 15°C. Wrap up your sightseeing on the 15th (Tue) early enough to travel to Victoria Falls. Escape the urban bustle at River Rafting & Tubing and Zipline. Spend the 16th (Wed) spotting exotic species with a safari tour. Next up on the itinerary: take in the dramatic scenery at Mosi-oa-Tunya / Victoria Falls National Park, take an unforgettable tour with a helicopter tour, and snap pictures at Victoria Falls Bridge. Plan trip to Victoria Falls with our itinerary maker to find out where to go and what to do. Traveling by flight from Plettenberg Bay to Victoria Falls takes 5.5 hours. Alternatively, you can do a combination of bus and flight; or drive. Traveling from Plettenberg Bay in October, expect nights in Victoria Falls to be somewhat warmer, around 23°C, while days are much warmer, around 39°C. Wrap up your sightseeing on the 18th (Fri) to allow time to travel to Sharm El Sheikh. Get in touch with nature at Safaris and Submarine Tours. Eschew the tourist crowds and head to Shark Diving and Ghibli Raceway. And it doesn't end there: contemplate in the serene atmosphere at Coptic Orthodox Church, pause for some serene contemplation at The Heavenly Cathedral, appreciate the history behind Monument to the Victims of Plane Crash of Boeing 737, and kick back and relax at Shark's Bay Beach. To find maps, reviews, photos, and more tourist information, you can read our Sharm El Sheikh online trip planner . Traveling by flight from Victoria Falls to Sharm El Sheikh takes 15 hours. Alternatively, you can do a combination of car and flight; or do a combination of flight and ferry. Expect somewhat warmer evenings in Sharm El Sheikh when traveling from Victoria Falls in October, with lows around 28°C. Finish your sightseeing early on the 21st (Mon) to allow enough time to drive to Dahab. Get in touch with nature at Coral Reefs and Scuba & Snorkeling. You'll discover tucked-away gems like Blue Hole and Horseback Riding Tours. Go for a jaunt from Dahab to Saint Catherine to see St. Catherine's Monastery about 1h 05 min away. To see traveler tips, photos, ratings, and other tourist information, you can read our Dahab trip planner . You can drive from Sharm El Sheikh to Dahab in 1.5 hours. Another option is to take a bus. In October, daytime highs in Dahab are 38°C, while nighttime lows are 28°C. Finish your sightseeing early on the 24th (Thu) so you can travel to Hurghada. Take a break from the city and head to Dolphin & Whale Watching and Speed Boats Tours. You'll explore the less-touristy side of things at Parasailing & Paragliding and Mosque El Mina Masjid. Spend the 27th (Sun) in unforgettable company with a swim-with-the-dolphins experience. The adventure continues: head off the coast to Mahmya Island and pause for some serene contemplation at Coptic Cathedral of Saint Shenouda. To see maps, photos, where to stay, and more tourist information, you can read our Hurghada trip app . You can do a combination of bus and ferry from Dahab to Hurghada in 6 hours. Alternatively, you can do a combination of car and ferry; or take a bus. Expect a daytime high around 38°C in October, and nighttime lows around 26°C. Finish your sightseeing early on the 28th (Mon) so you can travel back home.